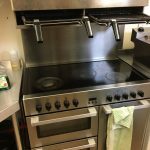 The former Clock House Bistro in Tillicoultry, near Stirling, has announced the sale of its kitchen equipment. A total of nine separate items are available, some with accessories, and all at a significant discount off the original purchase price. ORIGINAL INVESTMENT: £10,649.00. SEPARATE SALE PRICE: £6,123.00. WILL ACCEPT £5,800 INC. VAT IF TAKEN TOGETHER. Contact Trish Ballantyne on 07970 549 224 for more info and to arrange a viewing.